We are amongst the most reputed names in the industry, offering Anker Hoist. Our company has gained name and fame in presenting Anker Hoist. 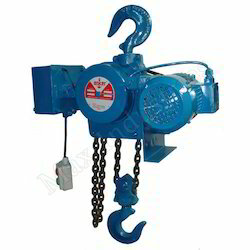 Anker Electrically operated chain hoist is a simple but robust and safe hoisting machine incorporating only a few parts which are perfectly machined and assembled to ensure safe reliable and trouble free service for a long time. The hoist is of enclosed design. All moving and bearing parts are free from dust enhancing the hoist life. We are amongst the most reputed names in the industry, offering Anker Electric Hoists.